It’s time to put together your first virtual assistant contract. I know… you’re nervous. What needs to be included? How can I make sure I’m covered, legally? We had so much positive feedback from our last post/interview with Danielle Liss from Businessese, that we thought it would be good to do a follow-up post to make sure that everyone knows what’s what when it comes to virtual assistant contracts. Unfortunately, the legal side of a virtual assistant business can go neglected (or worse, ignored) for far too long due to a lack of funds, knowledge, or both. Navigating the legalese of contracts can be especially difficult if you aren’t sure what to look for. I’m telling you, Danielle gave us the total hookup in this guest post. You’re going to LOVE it. Let’s jump right in! As you are creating or revising your contract as a Virtual Assistant, here are five key provisions that should be in EVERY VA contract (no exceptions!). You want to get paid for the work you do, right? (Duh!) And I would dare say most upright, ethical business owners will want to PAY you for the work you do! However, there are many factors to consider when outlining your payment terms. What is your hourly or package rate? What methods of payment will you accept? Will you require payment in advance? What about deposits? Tip: Remember, a virtual assistant is not an employee and is typically not a salaried position. A VA will, therefore, also be responsible for payment of all taxes. Your payments will be made in full, without deductions for any taxes or employee benefits. Remember to set aside approximately 30% for the tax man! Nobody likes to fire a client. It’s awkward and uncomfortable. But- I’m going to break it to you now… at some point in your VA business, you are likely going to have to part ways with a client. That’s why it is important to ensure that your virtual assistant contract has provisions for how the termination will happen. Ideally, a project goes well, you love your client, and you won’t need to exercise this clause. However, it is better to be prepared with a specific clause, just in case there is an unfortunate need to use it. Who may terminate – Make sure it is specific as to whether both parties have the right to terminate. How to terminate – What process needs to be followed before terminating? Does it need to be in writing/via email? When to terminate – How much notice is needed before the termination becomes effective? Payment – How is the payment handled if the agreement is terminated? Typically, the contractor will be paid pro rata, which means paid for the work completed until the termination is effective, but this should be specifically stated. Trust is an integral part of ANY relationship, not least of which are our working relationships. A good, confidential virtual assistant is worth her/his weight in GOLD. To that extent, most virtual assistant contracts will have a confidentiality provision, even if only to provide peace of mind for the client to show that your biz is seriously legit. The key to a good confidentiality provision is to ensure that both parties know exactly what is covered so there are no surprises or accidental disclosures. If the VA will receive access to any company logins, it is especially important to discuss how this information should be stored and used. Tip: Psssst…. LastPass is a secure and FREE resource if you’re feeling a little lost on what to recommend for logins! If a client asks, a virtual assistant can agree to a restrictive covenant, such as a non-compete or a non-solicitation provision. For those unfamiliar with these provisions, a non-compete clause restricts your ability to engage in the same type of business as your client for a certain period of time or within a certain geographical area. A non-solicitation clause means that one party agrees not to market, advertise to, or otherwise solicit clients or customers from the other. In order to be enforced, these provisions must be reasonable. Be sure to outline the complete terms of these restrictions in your contract; some covenants that are too specific can limit your ability to do business. Be sure to check with the laws of your state before agreeing to any restrictive covenants, as the ability to be enforced can vary widely from state to state. Typically, in the online business world, we see these provisions used when a company is working with subcontractors who work in a similar field. For example, if you own your own virtual assistant company and you hire other virtual assistants to subcontract for specific products, the contract may contain restrictive covenants to ensure that the subcontractor does not try to solicit your clients. In the relatively new world of online business, services offered by virtual assistants can often seem intangible. That’s why it’s important to ensure that your virtual assistant contract specifically outlines exactly what you will be doing for the client. Get a specific list of your tasks so you can ensure your performance. Be sure to create and provide some type of measurables to your client, whether that’s a completed project, website, Word Document, inbox zero, time tracking log, or something similar. Looking for an iron-clad virtual assistant contract for your business? 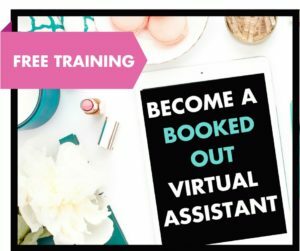 With the help of attorney Danielle Liss, The Virtual Savvy has created a complete contract made JUST for virtual assistants in our “VA Toolbox”. 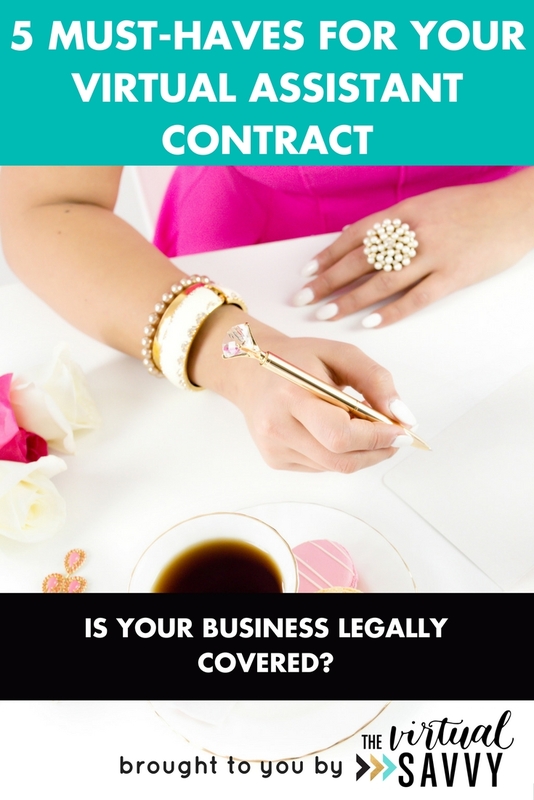 If you have a virtual assistant business, it’s time to make sure you are fully covered with a contract that was made specifically for you. Click here to get full access to the VA Toolbox today. Do you have a contract in place for your virtual assistant business? Why or why not?